Spiritual care and chaplaincy care have increasingly become topics of research in clinical journals. Just as in all other areas of health care, policies and interventions in spiritual care are seeking their grounding in clinical evidence. More and more, chaplains and administrators are looking closely at chaplaincy and asking: What is evidence-based best practice for this clinical situation? How do we know this intervention works? What is the precedent? It is incumbent upon chaplains in all professional settings to not only keep abreast of the latest research relevant to our work, but to also proactively seek out evidence to support the decisions we make. These are the kinds of issues that the current research into spiritual care and chaplaincy care addresses. This webinar will help each chaplain find the most relevant, most recent, chaplaincy-related research available. The presenters will introduce the best published chaplaincy-related papers from the 2015 calendar year, broken down by category, and provide a kind of verbal annotated bibliography to the participants. We have done the hard work - locating, sorting, reading and evaluating the evidence. Now come and hear us present the crÃƒÆ’Ã†â€™Ãƒâ€ Ã¢â‚¬â„¢ÃƒÆ’Ã¢â‚¬Å¡Ãƒâ€šÃ‚Â¨me de la crÃƒÆ’Ã†â€™Ãƒâ€ Ã¢â‚¬â„¢ÃƒÆ’Ã¢â‚¬Å¡Ãƒâ€šÃ‚Â¨me of research relating to our profession. And leave better informed, equipped with the latest and best evidence for chaplaincy care best practices. 1. Familiarize themselves with current chaplaincy related research. 2. Identify the key findings of important chaplaincy-related research. 3. Articulate potential applications of this research to one's own chaplaincy practice. 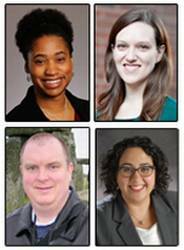 Krisha Arvin MDiv BCC (top left) is a palliative care chaplain at Emory University Hospital, Atlanta, GA. She serves on the 2016 Conference Planning Committee as Spiritual Needs chair. Sarah Byrne-Martelli MDiv BCC (top right) is a staff chaplain II/program coordinator at Beacon Hospice, Beverly, MA. She serves on the BCCI Commission on Certification and on the 2016 Conference Planning Committee as Plenary Speakers chair. Brian Hughes MDiv BCC (bottom left) is a stay-at-home father and a consultant at Health Care Chaplaincy Network, New York, NY. He serves as chair of the 2017 Conference Planning Committee. Geila Rajaee MDiv BCC (bottom right) is the manager of Spiritual Care Services at Mount Carmel Health System, New Albany, OH. She serves as the APC state representative for Ohio.